BEIJING -- A car plowed into a crowd of children outside a primary school in northeastern China on Thursday, killing five people and injuring 18, a local government spokesman said. Security camera video showed a line of children crossing the street in front of their school when a car approaches, which then changes lanes and swerves into the crowd of children. 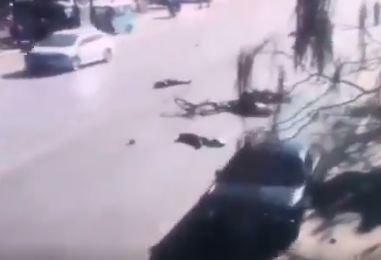 It wasn't clear if the crash was a deliberate attack or whether the driver was swerving to avoid obstacles in front of him, but it comes after a series of vehicle attacks and attacks on schoolchildren in the country.